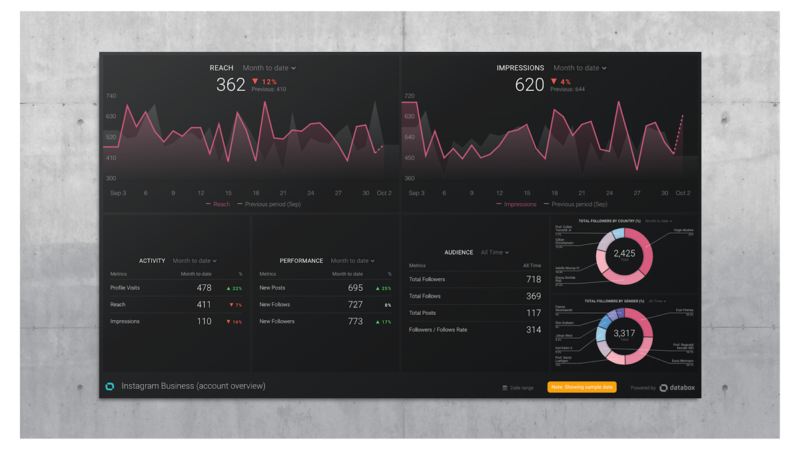 Track important campaign metrics from your Instagram Business account and visualize reach, impressions, post engagement, follower demographics (and more) in minutes. Ad spend on Instagram is growing at 4x the rate of Facebook Ads. Keep in mind that this doesn’t mean ad spend on Facebook is declining. In fact, most marketers are spreading ad budget across Facebook, Twitter, LinkedIn, Google, and Instagram. Starting today, you can track and visualize performance from these ad platforms all in one place. Today, we’re officially rolling out our newest integration – Instagram Business. 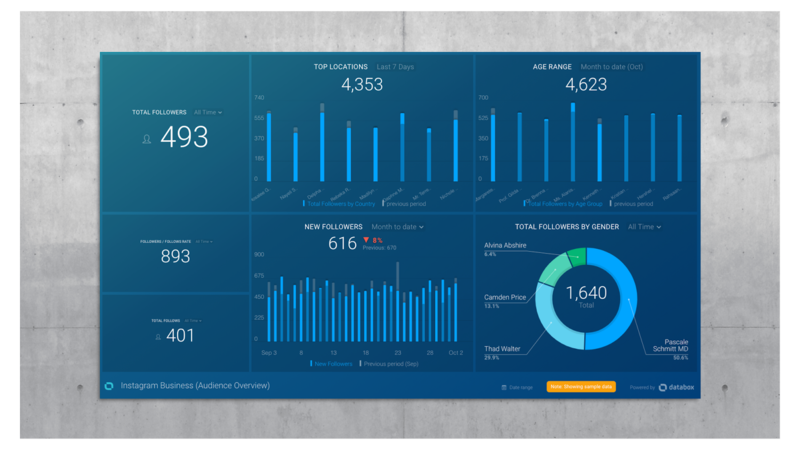 At launch, there are 25 Instagram Business metrics that you can track in Databox, including pre-configured Datablocks that you can drag-and-drop right into your dashboard–the data will populate with the visualization automatically. We’ve also created a few pre-built reports that will get you up and going as quickly as possible. All you need to do is connect your Instagram Business account and your data will populate in just a few seconds. Including the basics – like reach, impressions, and profiles visits – this template gives you a complete overview of your account’s performance. Which posts are most popular with your followers? What’s the gender breakdown of your Instagram following? Because this report is so comprehensive, it’s the quickest and easiest way to track performance in real-time, make strategic adjustments based on what you’re seeing in terms of engagement, and communicate the ROI of your Instagram activity to the rest of your team and/or clients. Grab the free template to get started. With this report, you’ll be able to drill down into the specific posts that are generating likes and comments. This helps signal the type of content your followers find most interesting, allowing you and your team to make adjustments based on the engagement you’re seeing both historically and in real time. Post more of what your followers love. In this report, you’ll see a breakdown of important ad demographics like age, gender, and top locations of your followers. You’ll also be able to track new followers, your follower-to-follow rate, as well as the growth rate of your overall following. Before you go any further, let’s make sure you’re using an Instagram Business account rather than a personal one. 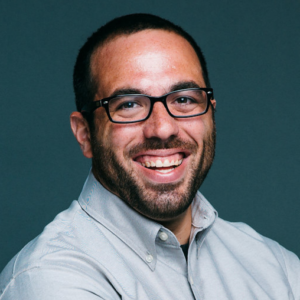 Instagram announced business accounts in 2016, and because many brands were already using Instagram prior to that, many of them may still be using personal accounts as their business account. Want to customize your Instagram reporting? 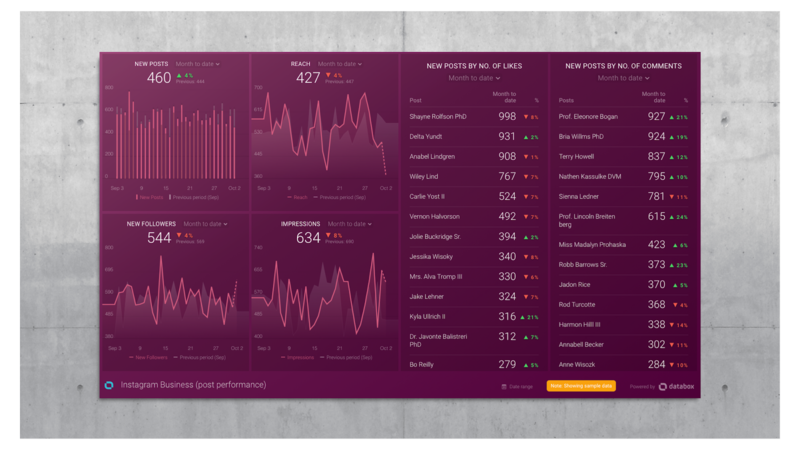 You can create a dashboard from scratch and start visualizing all of the metrics from Instagram Business that you need.